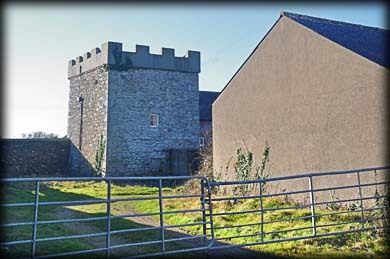 This Tower House at Cullenstown probably dates to around the beginning of the 17th century. There is a reference to it from c.1634/54 when John Cullen possessed the castle and 80 acres in Cullenstown, possibly from the Cheever family. I am not sure how many floors existed before the building was reduced to two storeys. 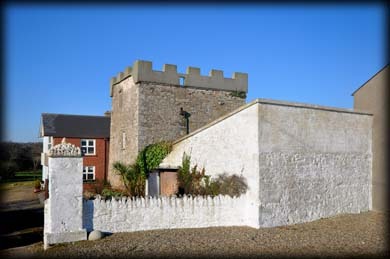 The remaining floors have been adapted as a modern residence and a two storey house, built between 1760-90, abuts the north wall of the tower house. The quoins and base batter are the best feature of this squat looking castle. I am not fond of the relatively modern concrete crenellations that now adorn the tops of the walls. Please note this is a private residence. Situated: From Wexford head south on the R730. After 2k turn right for Morntown. After 15k slight left onto R738 then 600 metres right turn onto R736. 5.5k turn left then right. 3.5k keep right. Then next left. The castle is down here on your right. Discovery Map 77: S 8757 0865. Last visit Feb 2015.